ONE OF A KIND MONTEREY COUNTRY CLUB CONDO WITH PRIVATE POOL & SPA!! Beautiful contemporary furnishings throughout this spacious vacation home in one of the most desirable country clubs in Palm Desert – The private side yard offers a desert oasis with sparkling pool and spa and plenty of patio furnishings for family and friends to relax and enjoy perfect outdoor desert living. It also offers a second east facing patio off the great room that overlooks a green belt and one of the many community pools and spas … no fear of errant golf balls at this home … a perfect area for children and grandchildren to run and play! This is not your typical vacation home … the owners have gone far and beyond in providing a comfortable, beautifully furnished home with all the amenities you could dream of. The spacious great room has plenty of seating for the entire family and centers around a large flat-screen TV mounted over the fireplace. The formal dining room offers seating for four and for casual dining, the kitchen is furnished with a small dinette table with seating for four. The kitchen has a warm homey feeling and has been beautifully updated with quality stainless appliance and includes a gas range and refrigerator with in-door ice and water dispenser. Your cook will love how well the kitchen has been stocked with cooking and serving needs … from casual meals to a Thanksgiving feast, this kitchen is ready to work. The master bedroom suite has been furnished with a wonderfully comfortable king size bed with controls for each side that lifts the head of the bed to a sitting position or any position between. You will also enjoy the sizable flat-screen cable TV. The on-suite has his and hers sinks and an update walk-in shower. The guest bedroom is furnished with two twin beds and cable TV. The guest bath has a shower/tub combination. In addition to the two bedrooms, there is an office/den with a queen size murphy bed making this multi-use room a comfortable third bedroom, a work space with desk to set up your own laptop or a cozy room to watch TV. 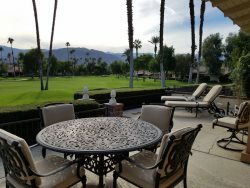 Guests will have the very best of two worlds in this lovely vacation home … a highly requested, gated country club in the heart of the desert but with the feel of a private single family home and the added advantage of being able to enjoy your own private pool and spa! Perfect! Additional amenities include Wi-Fi, cable TV throughout the home and free local, U.S. and Canada calling. Owner will consider a dog with pet fee. Please inquire about pets prior to booking this property. We will need owner approval. No cats please and no smoking.